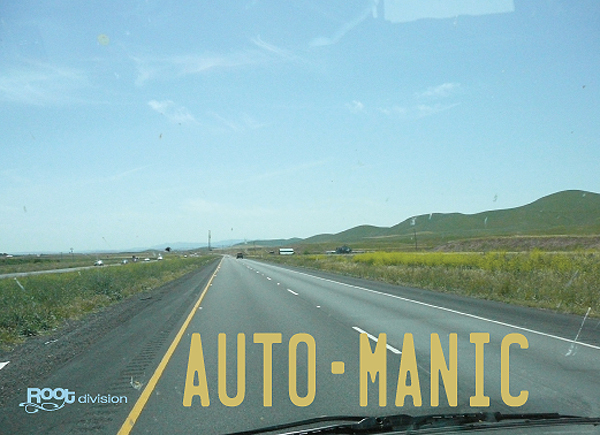 Auto-Manic at Root Division opening June 12th! Please swing by and check out this show I’m curating at Root Division in June! Ever since the first interstate highways began carving a path through the urban landscape in the early 50’s, California has been the epitome of American “Car Culture.” Nostalgic images of the warm summer sun reflecting off the chrome bullets on the ached tail fin of a steel behemoth have given way to technologically savvy hybrids that can tear up a track at 0-60 mph in less than four seconds, and are nearing 130 miles per gallon. From Thunderbirds to Teslas, the freeways, side streets, beaches and parking lots of California have always been clogged to the saturation point with automobiles. These everyday objects have deeply imbedded themselves into the collective unconscious of artists working within this urban environment, and created a fertile trajectory for exploring the relationship between man and four wheeled machine. In Venice Beach, CA, at the Speedway Avenue Garage on April 23, 1974, Chris Burden had himself voluntarily crucified onto a Volkswagen Bug. The following year, on July 4, 1975 at the Cow Palace in San Francisco, CA, the Bay Area Art Collective Art Farm staged a full-scale collision of the Phantom Dream Car (a modified 1959 Cadillac) into a flaming wall of televisions as part of their piece “Media Burn”. Utilizing the car as a cultural icon and critiquing American ideals of heroics and technological superiority, these early performances gave way to a new breadth of work in the generations to come. At our current vantage point, within a deep and crippling economic recession, with CO2 emissions reaching an alarming level and gas prices teetering on the preposterous at times, we must re-evaluate our relationship with the beloved car. With the devastating fall of the big American Car Companies and the disappearance of such iconic brands as Pontiac, a dramatic new relationship is evolving between producer and consumer, pragmatist and dreamer. Alternative modes of transportation are becoming more visible. Bicycles are beyond trendy; messenger bags are the new fuzzy dice. There are golf carts on city streets. High Speed Rail proposals are finally being funded. As we speed off into a new era of travel, technology and environmental responsibility, the artists in Auto-Manic respond to the role of the automobile, and it’s alternatives, in art. If you get a chance please check out this show my friend Michael developed in which he interviewed MFA students for the SFAI class of 2005 (myself included) to find out where they are now and what they are up to now. Really awesome project! “What’s it like having a career as an artist?” Michael Zheng posed this question to his former classmates at the San Francisco Art Institute as they approached the five-year mark since graduating with MFA’s. In preparation for his new show The Profession, the San Francisco based artist conducted extensive video interviews with thirty-seven alumnae to discuss their experience as artists since graduation. With just a fraction of art school graduates succeeding in the gallery world, Zheng expected to wade through depressing accounts of art world misery. However, while stories of maturation through struggle were common, surrender and a sense of failure were not. Curated by Steven Wolf Fine Arts, and inspired by Michael Apted’s documentary series Up, The Profession will premiere at Marina Abramovic Institute West on Friday, May 21, and run through July 2. The exhibition will consist of multiple video projections of subject interviews with Zheng and an interactive website calledtheprofessionproject.com which will go live when the exhibition opens. Viewers will be able to watch the videos, write comments on a blog and artists will be able to post a link to their own video narratives about life in the art world, which would then be screened publicly during the exhibition. The Profession adds to a growing critical discourse on the contemporary art world as it expands and becomes more professionalized due to the proliferation of MFA studio programs. In the interviews, Zheng asks the artists a variety of questions—what are the challenges to maintaining a studio practice? What has been your experience with commercial galleries? How has art school prepared or failed to prepare you for careers in contemporary art? The breadth of these topics allow for a rare chance to see artists open up not only about their work but about their lives.